CINCINNATI, OHIO -- October 14, 2016 –– DeBra-Kuempel proudly announces that 100 of its construction workers at various job sites throughout Ohio are wearing EMCOR Pink Hard Hats in October, Breast Cancer Awareness Month, as a "Call to Action" supporting breast cancer screening and awareness as part of EMCOR's 8th Annual "Protect Yourself. Get Screened Today." campaign. DeBra-Kuempel employees will be seen by scores of people as they work at a host of client locations ranging from commercial and healthcare, to high tech facilities. A market leader in mechanical, electrical, plumbing and process piping services, DeBra-Kuempel is a subsidiary of EMCOR Group, Inc. (NYSE: EME), a Fortune 500® leader in mechanical and electrical construction, industrial and energy infrastructure, and building services for a diverse range of businesses. “This is EMCOR’s 8th consecutive year of spearheading the national Pink Hard Hat initiative. Over the years people have come forward to say they believe this unique way of raising awareness of the importance of breast cancer screening has had a positive impact on their own lives or that of a loved one,” stated Joseph Clark, President, DeBra-Kuempel. "Many of our employees wear hard hats on a daily basis for personal protection, and we’re proud of their commitment to wear an EMCOR/DeBra-Kuempel Pink Hard Hat in October to raise awareness for breast cancer, reminding women and men they can help protect themselves by getting screened." 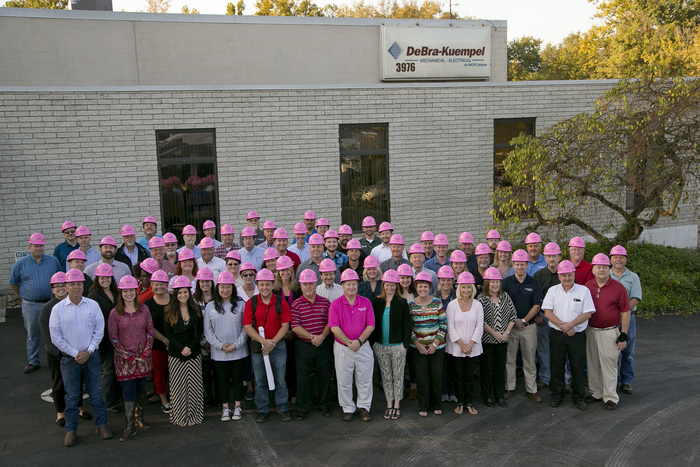 DeBra-Kuempel employees will be joined by thousands of additional EMCOR employees nationally wearing Pink Hard Hats during October at hundreds of work sites, ranging from hospitals to bridges, malls to military bases, and data centers to refineries. The “multiplier effect” continues as even more people are reached with the “Protect Yourself. Get Screened Today.” message when EMCOR employees take the Pink Hard Hats home each night and they are seen by spouses, daughters, sisters, neighbors, and many others. Millions more people will be reached nationally by EMCOR’s fleet of 7,000+ service vehicles, including DeBra-Kuempel’s vehicles, which are displaying Pink Hard Hat posters during October with the “Protect Yourself. Get Screened Today.” campaign message. is a subsidiary of EMCOR Group, a Fortune 500 company with estimated 2016 revenues of ~$7.4B, EMCOR Group, Inc. (NYSE: EME) is a leader in mechanical and electrical construction, industrial and energy infrastructure, and building services. A provider of critical infrastructure systems, EMCOR gives life to new structures and sustains life in existing ones by its planning, installing, operating, maintaining, and protecting the sophisticated and dynamic systems that create facility environments---such as electrical, mechanical, lighting, air conditioning, heating, security, fire protection, and power generation systems---in virtually every sector of the economy and for a diverse range of businesses, organizations and government. EMCOR represents a rare combination of broad reach with local execution, combining the strength of an industry leader with the knowledge and care of 170 locations. The ~33,000 skilled employees of EMCOR have made the company, in the eyes of leading business publications, amongst the “World’s Most Admired” and “Best Managed”. EMCOR’s diversity---in terms of the services it provides, the industries it serves and the geography it spans---has enabled it to create a stable platform for sustained results. The Company’s strong financial position has enabled it to attract and retain among the best local and regional talent, to undertake and complete the most ambitious projects, and to redefine and shape the future of the construction and facilities services industry. Additional information on EMCOR can be found at www.EMCORGroup.com.